The larger quilt is going well. I printed the last pieces of fabric. And today I finished piecing the top. Saturday, I dyed a large piece of blue fabric for the backing. I'll try and prepare the sandwich tomorrow. And then, a collaged postcard made with some of my gelli prints. Last week, I spent a lot of time in the garden, cleaning pots and planting new flowers. I forgot to take pictures, but it's great to be able to work outside again. Your quilts are progressing beautifully, Francoise, I love the way the ones in the top left and bottom right pics are coming along, very bold. 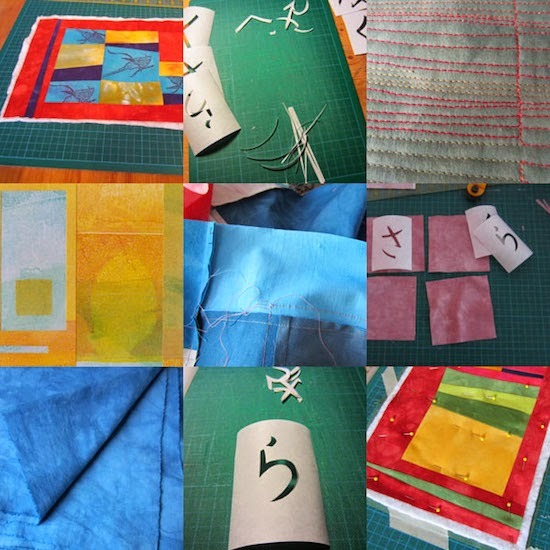 Love your tree quilt & Gelli prints Francoise & your new small quilts look great too. Thanks for commenting on my prints. It sounds like a lot of fun, quilting your small quilts. Any new weaving projects on your loom? 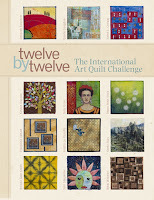 Oh, I am curious about all of these little scrap quilts...and the stencils! Can’t wait to see your finished scrap quilts! Enjoy!